When many people think of saltwater, they think of the ocean, with enough salt to sting your eyes and leave a taste in your mouth. Thankfully, salt water systems in a home or commercial pool are nothing like that. Instead, they are a creative, more natural way to reduce the overall level of microorganisms in the pool, making the pool safer. Like chlorine and other chemical treatments, it rids the water of contaminants like urine, sunscreen, perspiration, and body oil. While many pool owners assume that they have to bombard their pool with chlorine and other chemicals, a salt water pool system avoids the use of excess chemicals. 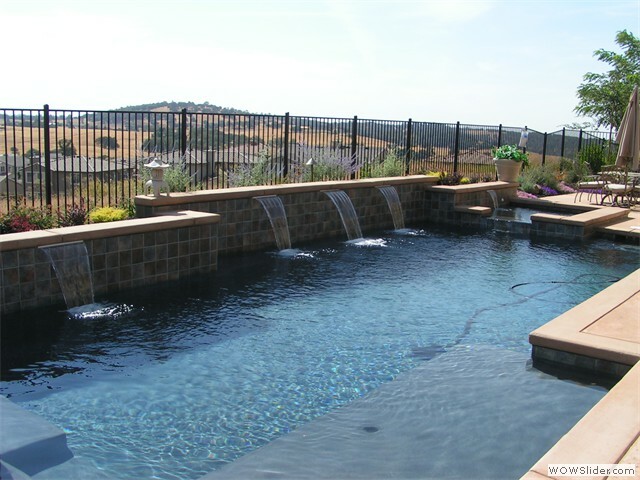 While the pool construction is the same for both options, the maintenance that each system requires will vary. Periodic testing will be important no matter which system you use. Use this quick guide to determine which option is right for you. To maintain a chlorine pool, you must use either tablets or a liquid chemical that is measured and installed by hand. Chlorine should often be added several times per month, depending on pool use. Occasionally, pool owners should also go through a “shocking” process that puts a lot of chemicals into the water to kill excess bacteria. Chlorine pools should also be cleaned monthly. Chlorine pools are generally cheaper to initially install compared to salt-water pools because of the additional equipment in a salt water pool. However, the chemicals can sometimes be harmful to swimmers and may erode pool equipment faster than salt water pools. Salt water pools are a much newer concept compared to chlorine pools. They use an ionizer that converts salt into chlorine and calcium. Installing this type of system requires purchasing a saltwater converter and control box. The system automatically tests the water and regulates the amount of chlorine in the pool, so there is no need to physically add more chemicals or other substances to the water. Salt levels should be checked monthly, but the pool itself will only require cleaning every few months, and some would say only annually. However, you may need to clean inside the converted periodically to scrape away any calcium or other deposits. Salt water pools are “soft water,” which often feels better on the skin, causing far less irritation compared to chlorine pools. Maintenance is generally easier, but there is more upfront cost. It does still place chlorine in the water, but the overall amounts are much less. It can also attract bees.